Gas Type Hint Please select the type of gas supply that will be used to operate the stove. Do you really like to cook? 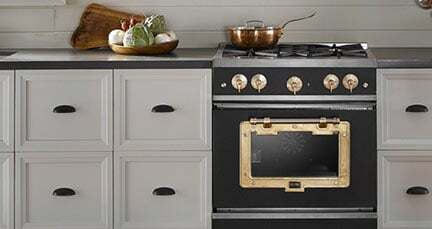 If so, you will love Big Chill’s 36-inch stove that works as great as it looks. The full motion grates let you slide pots and pans from front the rear burners without lifting them. It also has the largest oven capacity on a 36” stove. The authentic chrome trim and handle lend a sleek vintage look to our 36-inch stove, but the stove’s functions are completely modern. For those who love to bake, Big Chill’s 36” stove will accommodate a commercial-size baking sheet. 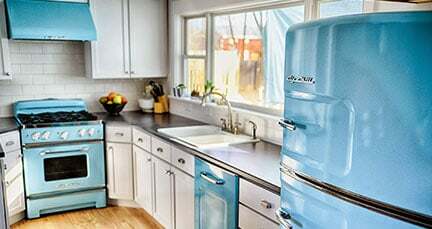 Although our appliances are retro looking, they are painted with a color-rich finish that will not introduce harmful VOCs into your home. Read more about our painting process here. 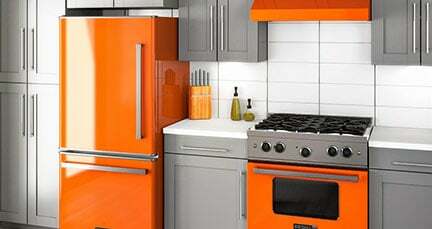 Unlike other 36-inch stoves on the market, ours is available in over 200 colors, including eight standard colors. » Your appliance will be delivered at the streetside entrance of your property and placed next to the curb. You are responsible for uncrating/unpacking the appliance and bringing it into your home. » If you want the appliance brought to your garage, or front porch, etc..., choose "Inside Service". Also, if a 40' semi-truck can't access your home, or you have a gravel / dirt driveway, or anything that will make the "Curbside Delivery" not achievable, please choose "Inside Service". » You can remove the fridge from its crate and take it into your house. Grab a set of tools, a dolly, a socket set, and a few of your strongest friends. The shipping weight of our fridges is close to 400 lbs. »The shipping company does all the hard work. They will uncrate your unit, bring it in your kitchen and set it in place and remove all debris. »Getting the range up a flight of stairs is an extra charge. »Our delivery personnel are handy, but they’re not authorized to connect gas or electric. Please contact an authorized gas installer or electrician for assistance.